I'm REALLY happy with my meal plan this week - it's yummy, it's healthy and I now have all of the ingredients for it. However, tonight, I kinda feel like I encountered one of the downsides of meal planning. My salad was AWESOME, don't get me wrong...I loved every last bite of it. But I really could have gone for something a little warmer - a soup would have been a better choice. Normally, I just switch my days around to have something suitable, but it didn't work so well this week...I was out all day, so the meal had to be speedy (i.e., not lasagna or pea soup). And I was saving the quinoa risotto and seared scallops for friday (and the scallops were still frozen). So that meant that I had a caprese salad of sorts for dinner. SUPER yummy, but not quite what I was craving after a day of tromping around in the snow. At any rate, this was a great meal. It's a side dish recipe, so the original recipe says it serves 5. As a meal, it serves 2-3 (it served us both good sized portions with two quite small lunch portions left over). You can put it together in about 15 minutes, and it involves absolutely ZERO cooking. It would be a GREAT choice for a potluck, or for a summer BBQ, or just one of those hot nights when you don't wantt to cook. The basil makes it....if you don't have fresh basic, make something else!!!! 1. Place in ingredients in a large bowl in the order listed. Pretty complicated, eh? Hubs loved it and is sad that I'm getting the lion's share of the leftovers. 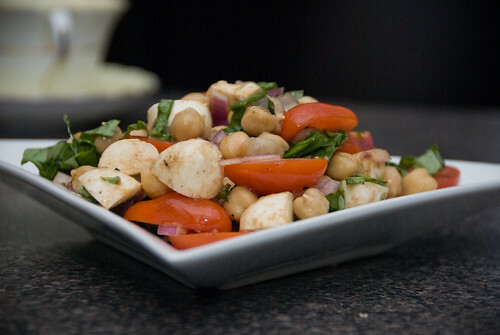 The chickpeas in it are great - full of fibre and protein. They really 'flesh' out this salad and make it a satisfying meal. Adding a slice or two of grilled garlic bread would be yummy too! However, hubs eschewed his super yummy pad thai lunch today in favour of MCDONALDS (meaning I'm totally going to win our game, hehe). Thanks for reading - tomorrow I"m making two lasagnas - one for the table and one for the freezer. Stay tuned. Just want to say that I just found your blog and i think it's great. I want to add your blog to my list of blogs I follow but I don't see it on your page. If you have a second please email me at myitaliangrandmother@homtail.com to tell me how to do it. It looks delicious! Too healthy for my Hubby though I think. You do love Eat, Shrink and Be Merry, don't you ? 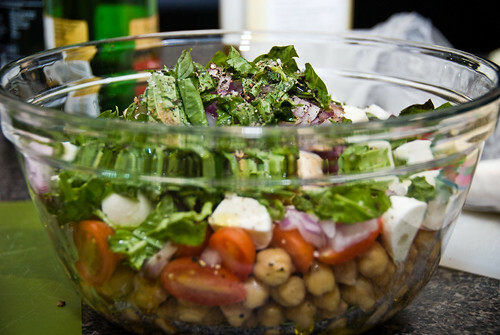 I make this salad now and again, but yours looks better! It's true that the fresh basil makes it. I'm considering trying to grow it inside this winter. did you resolve your problem of not eating frozen meals? inquiring minds do want to know! eating this for lunch right now - thanks for the inspiration!